I get that, except the Pause/Break key auto repeats on my Adv2, Atomic, QFR, and CODE TKL. I'd imagine if my OS was preventing Pause/Break on Adv1, it would do the same with all my other keyboards. That would mean that Adv1 sends key release even sooner than it should. Still curious why it does this with just the Pause/Break key. Not that I'd need have that key auto repeating. Are there plans to make the thumb keycaps on the Advantage convex? I just bought one of these and really like it. I do wish there were a graphical interface to remap keys though, perhaps something similar to the keyboard layout analyzer http://patorjk.com/keyboard-layout-analyzer/#/config, since making macros for some of the keys that split shifted and unshifted characters in a layout -- like / and ? on a standard keyboard -- is a bit of a pain. I like having both / and ? unshifted. You also have to make these macros for both left and right shift versions, since it treats both differently. The keyboard really doesn't like having the files for text remapping edited with an outside text editor, either, which makes the simplest method of creating a layout editor less intuitive. But on the plus side, once you get a form you like, it is really performs well. So all in all I still like it a lot, and I think I will like it even better as the firmware and support programs are improved. I really hope sometimes you'll reconsider and there will be upgrade pack for Advantage 1. I'm quite happy with its mechanics (even rubber F-keys), but that old bug with sudden CAPSLOCKING is getting me tired. Anyway, thanks for great work! Regarding outside text editor, I've found it to work much better after I've made any changes with outside editor to eject/dismount the keyboard (as a storage media), go to another layout, then switch back to your layout of choice. I've also disabled the option to mount the keyboard as storage device on startup as leaving keyboard mounted was leading to some issues. I really should count myself lucky that I almost never encounter the good ol' stuck modifier bug on my Adv1. I also use mine with hasu's USB-USB Converter so that may have something to do with it. I hope also upgrade kit to adv2, but I think adv1 and 2 is so different. So so, I upgraded the func keys mit cherry ml in diy stil. It's not so difficult, but mechanical switch is super. Do you have any internal pics of the function row key modification? Do the function row PCBs support ML keys or did you hand-wire them? I have some questions on programming and editing the layout files of the advantage2. Is there a forum or any location where such discussions are placed best? Can be purchased here. They are the same type of key caps that our current Adv2 and Adv1 keyboards use. DVORAK legends only is nice. Any update on Colemak-only keycaps that were mentioned on Twitter? I wouldn't mind replacing the keycaps on my Classic with those. Oooohhhh COLEMAK legends...that's a dream I've had more than once. I've been using COLEMAK since '09-'10 and I've realized I need to settle for no legends. I went to with a keyboard buddy for sushi and saki and saki and saki. Later we swing by his place and he shows some of the latest stuff he's working on. I'm impressed. Then he sorta laughs and shows me a keyboard he made and says "This is a mix of the old and the new" and he holds it proudly for me to get in on the insider joke. I draw a complete blank. He says "Recognize the keycaps?" I sorta did but couldn't place it. "The most famous/infamous Geekhack group buy in history?" I'm still blank. "The 7-bit Group Buy #3 that took YEARS?" I'm like "OOOOOHHHH YEEEAAAA", then he says "And the layout?" I look again and draw yet another blank. "The third most popular keyboard layout?". I'm so blank you can write on me like a chalkboard at this point. "It's COLEMAK". And I'm like "OOOOOHHHH YEEEAAAA....Is it really the third most popular layout?" DERP! Black Kinesis Advantage......with black high quality keycaps.......with transparent legend for keycap backlighting.......with dark orange (sorta Geekhack color)......and the legends are......wait.....wait....wait for it.....KLINGON! Very nice. How did you get your keycaps? 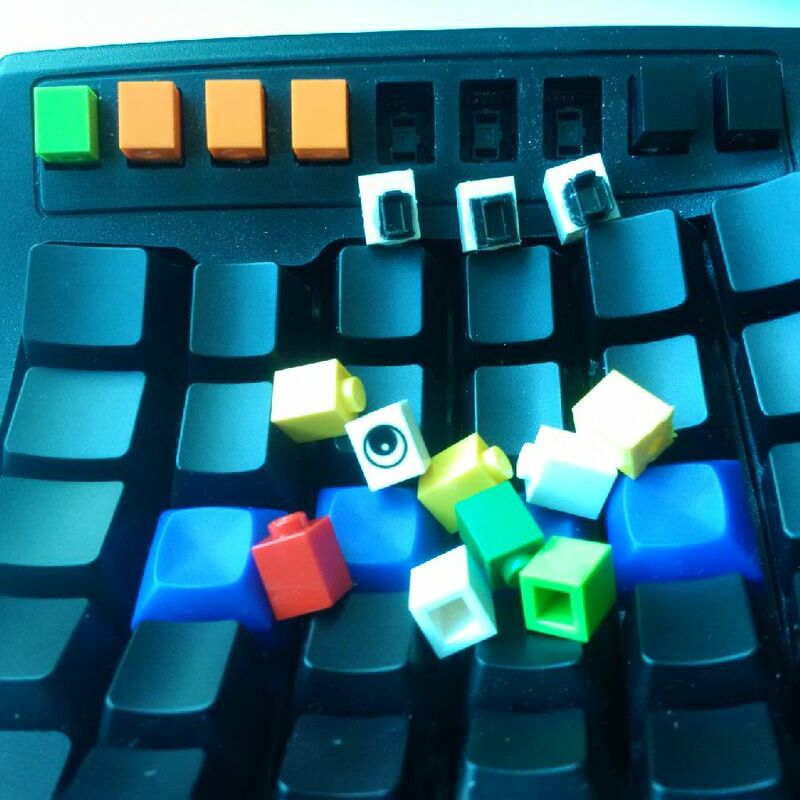 I've tried doing this myself, but I couldn't find any cherry ml keycaps in the right size, and I've tried 3d printing keycaps to fit but have trouble making stems to fit the cherry ml switches. Ah man, I totally missed this thread, awesome job on installing the ML switches. Where did you get the blank ML key caps? I'd like a source or two I can direct customers in the future. That's brilliant ! True geekhacker ! So I finally got around to replacing the switches on my Advantage2 and Advantage. Here are some photos of the process if anyone's interested. After using the advantage 2 for a couple days I can say for sure I already want to add function keys.